My friend Maria, an exchange student from Germany I met ten years ago, was getting married! Though we were heading over there under gloomy financial circumstances, it wasn’t an event to pass up. We weren’t really sure what to expect, since we did no research on Berlin sights nor did we know what German weddings were like. I had a feeling, from all the stuff she had sent over the years, there were traditions upon traditions–traditions seeping with tradition topped with a sprinkling of older traditions that give rise to modern traditions! Of course, we had to endure the traditional red-eye flight across the pond. Not finding the seats comfortable enough, Ryan couldn’t sleep. Everyone had finally quieted down and I was dozing when I stirred, Ryan decided to announce, through pressure-plugged ears, that he couldn’t sleep. I’m pretty sure everyone in the back half of the plane heard it. I think it’s hard for Americans to imagine modern war on home soil. I think that might be one of the allures of going to Europe: there is modern and ancient and everything in between architecture, diverse cultures, and most alluringly, the hint of the most dramatic and epic times in modern human history. To see a church bombed to ruins in WWII strikes a certain chord, but to see the ruins preserved as a memorial and that memorial sandwiched between two modern buildings strikes a deeper chord. This is the Kaiser-Wilhelm-Gedächtniskirche, near the Zoo. 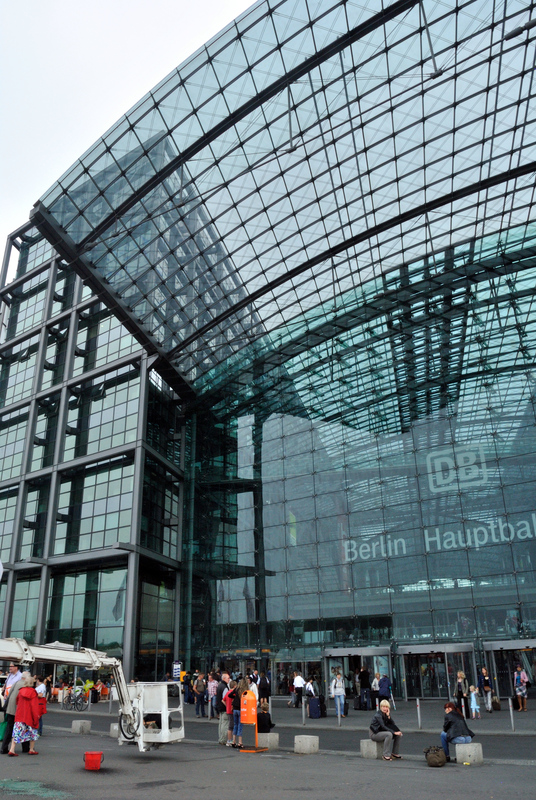 This is the Berlin Hauptbahnhof, a massive train station, the biggest in Europe [so says Wikipedia]. Tour guides, apparently fishing for a good story, call this the ‘Elephant Washer’. I’m not sure what the building actually is, but the crosses represent the 7 or 8 that tried to swim between East and West Berlin. 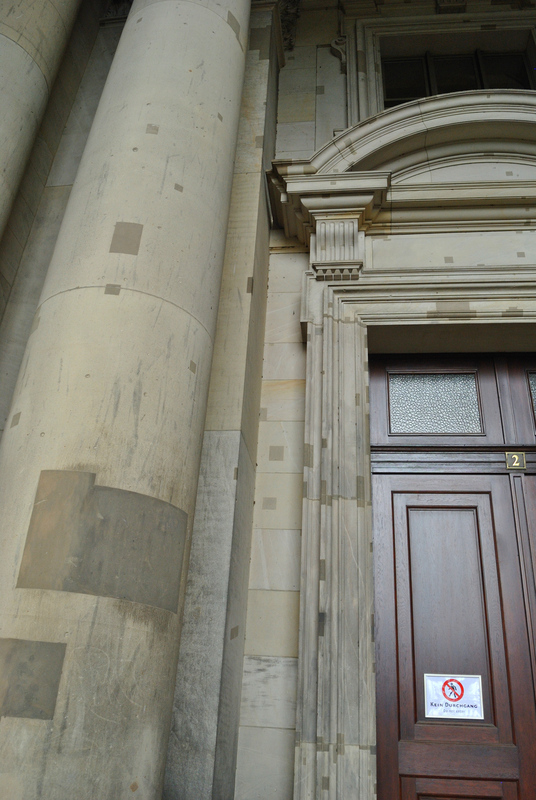 This is the Berliner Dom and if you take a close look [or click to enlarge] you’ll see patches top to bottom. If buildings could talk! You can find these all around Berlin, usually outside residences, but also occasionally outside business, too [I assume where there used to be residences]. They generally say the name, when they were born, and where and when they died or were deported. The first marker, Julius Goldstein, was deported to Auschwitz in 1943, but they don’t have information on when he died there. 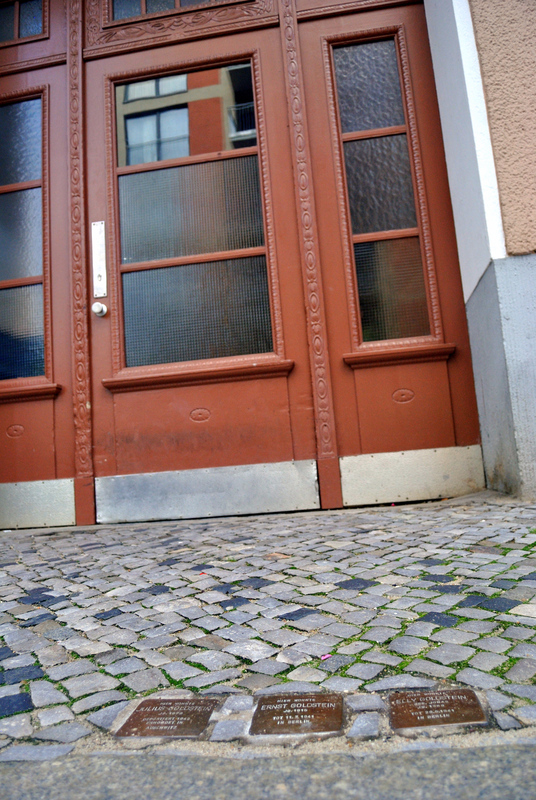 This is Maria’s door to her apartment building. Now that I’ve painted the dreary picture of atrocities and post-modern guilt, let’s move on to some cheery subjects! 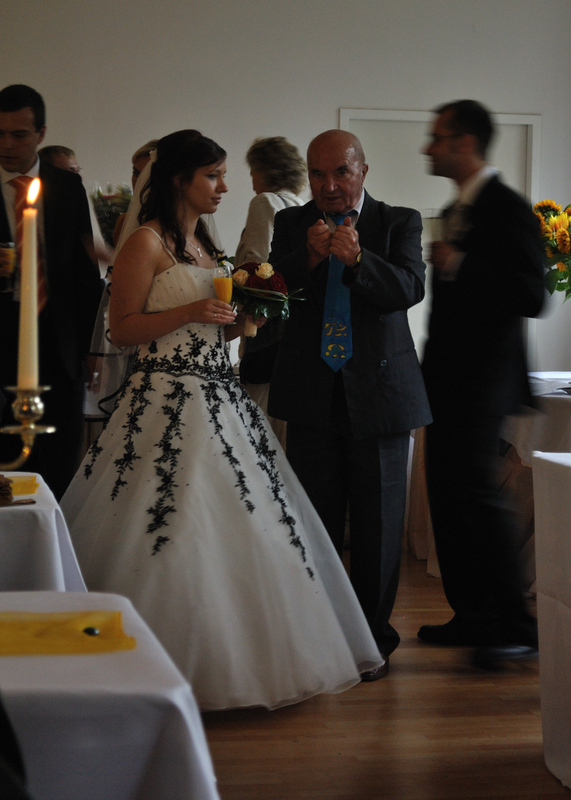 It was fascinating to see a German wedding! 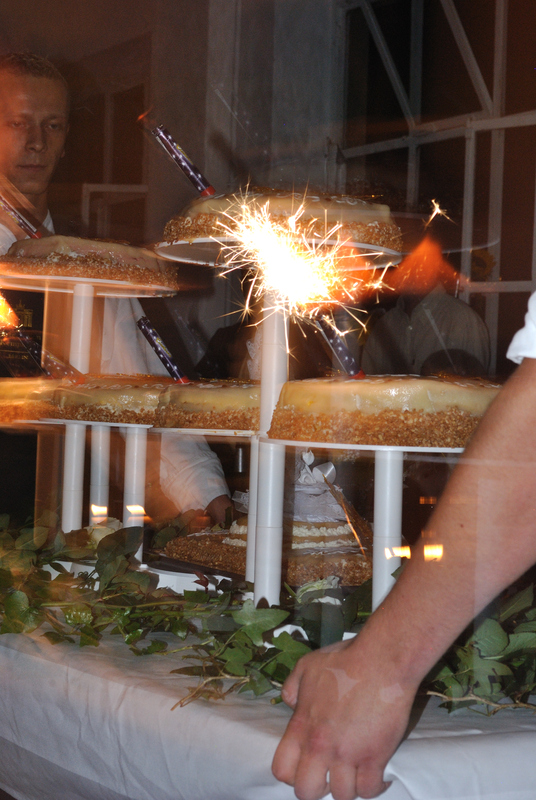 The cake isn’t just sitting on a table–NO! It gets its own entrance, with dramatic music, fireworks, and all! The beautiful bride, her blurry groom, and Opa from the Sea giving advice on how to build a house with your kids and bare hands and no Lowe’s down the street. 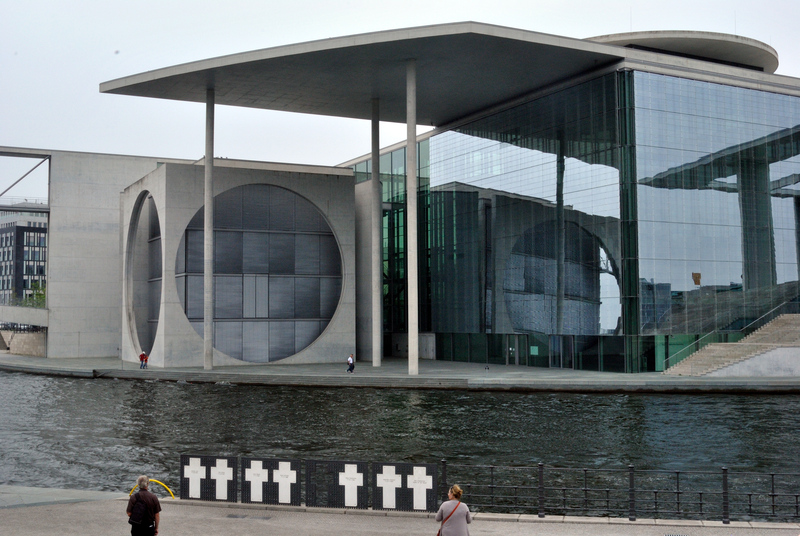 Berlin is, of course, a huge city with a large night scene, museums all over, and a great public transportation system. 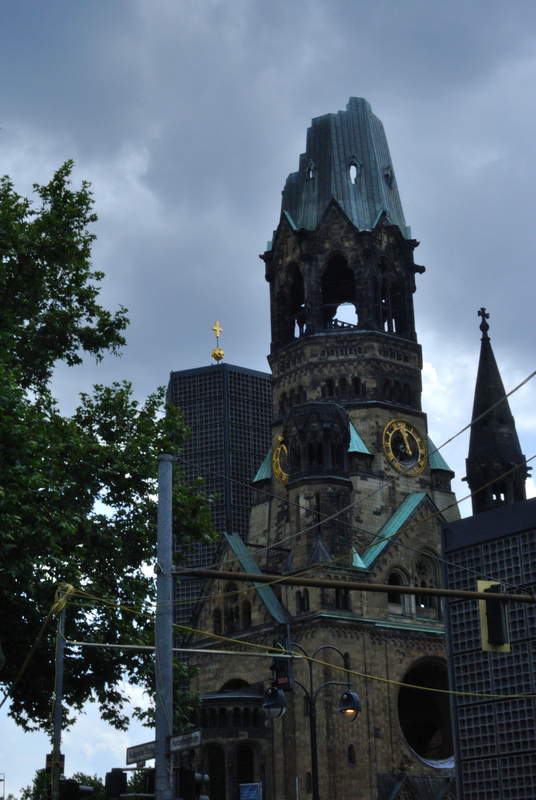 Check out the thumbnails below for my favorite shots of Berlin and the Baltic Sea! For more wonderful photography, stop by Scenic Sunday! 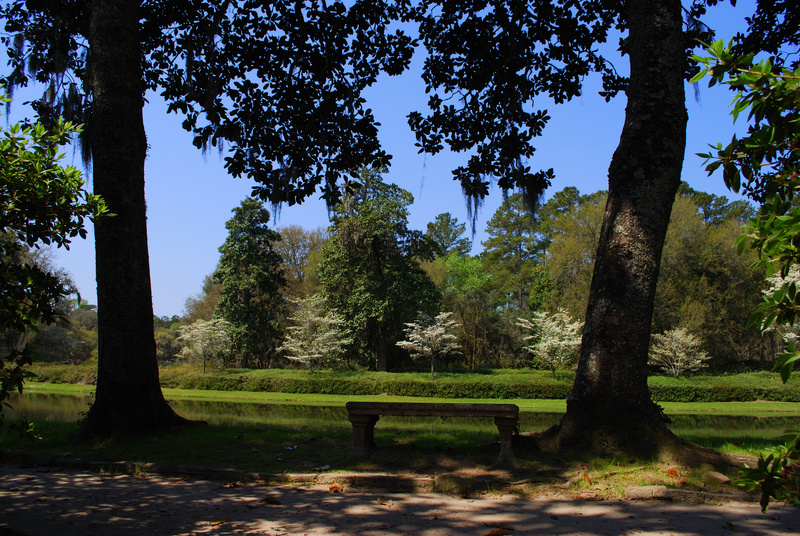 These two benches can be found in the lovely azalea- and camellia-filled gardens of the Middleton Place Plantation. 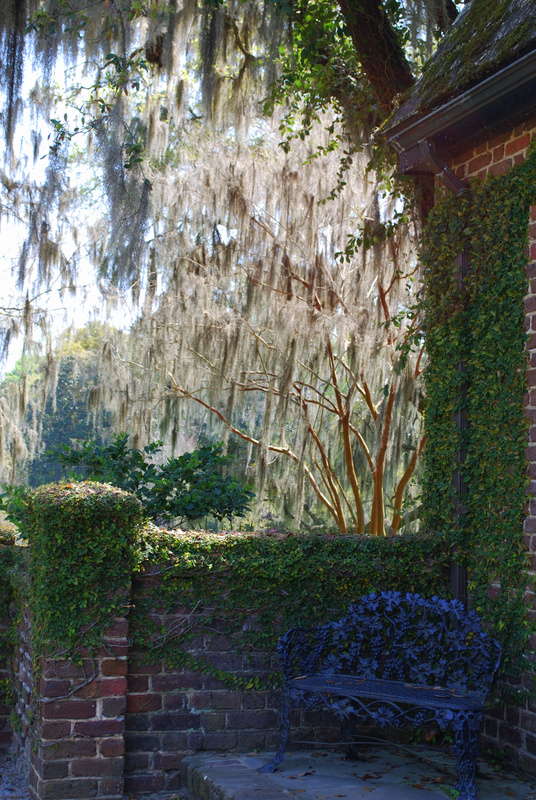 Started in the mid 1700s, the well-planned gardens on the Ashley River, 16 miles northwest of Charleston on Highway 61, recall an extraordinary history of residents and events, from colonial times to the modern day. Very much worth a day’s visit. There’ll be no robins in this post! I’ve seen them digging around in the snow, so I don’t believe they know what winter is! Daffodils are blooming, trees are budding, and various ectotherms are moving about. 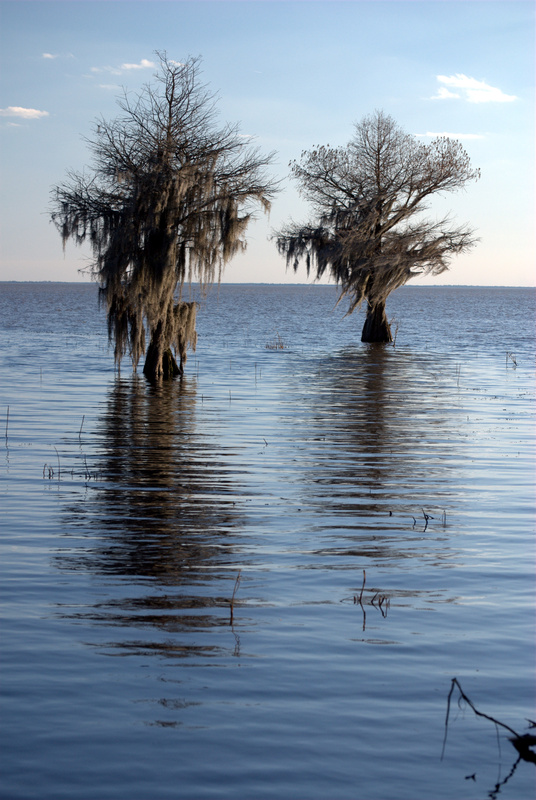 We visited Lake Moultrie hoping to see some wildlife. We spotted a large group of yellow-rumped warblers and an osprey, but not much else at the dam. A couple U-turns later and a few uncertain rights and we made it to a FWS managed area and walked around some impounded water areas. Spotted some woodducks, great blues, an egret, and a mallard pair that I swear were decoys. We walked until we hit a canal opening. There was a board damming it and a chain with a sign that would make it easier to walk across, but if you google ‘Lake Moultrie’ and look at Google’s suggestions, one is “Lake Moultrie alligator attack” and indeed, there happened to be, on a slightly cold, last day of February, an alligator waiting on the other side. 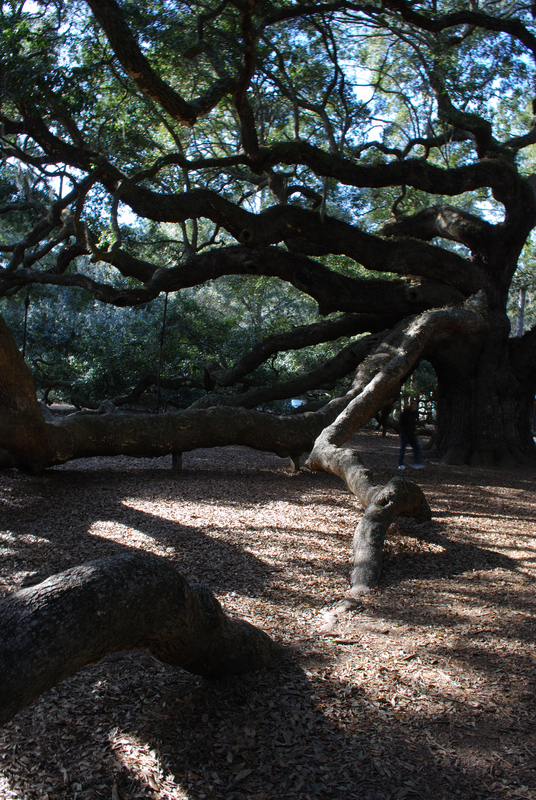 On a side note, we visited Angel Oak on Johns Island yesterday and found the tree [Whew! It’s a bummer when the navigator can’t keep ‘John’ and ‘James’ straight!] 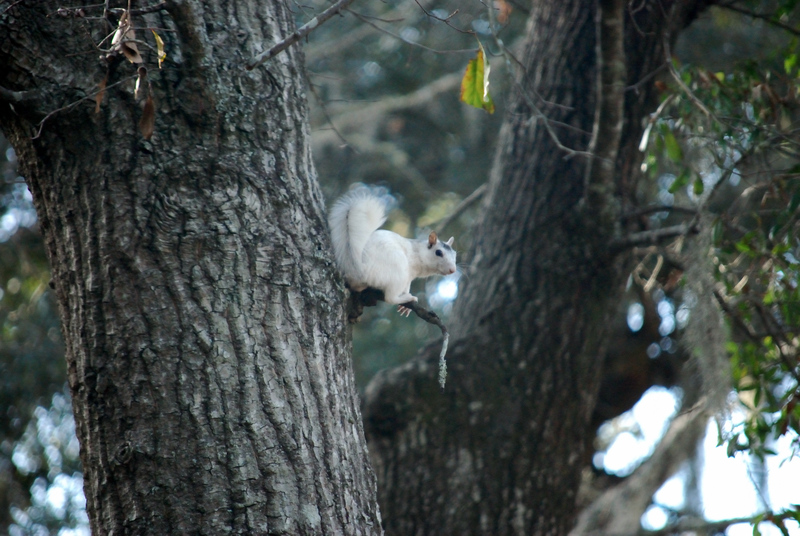 and also found some more uniquely colored South Carolina squirrels. Unfortunately, they weren’t too pleased with the camera pointed at them, so I didn’t get them sitting together. The mighty Angel Oak. They [angeloaktree.org] believe it’s 1,400 years old, and the oldest organism east of the Mississippi. It spreads over 17,100 square feet, has a lightning rod and supports for some of the branches. Check http://www.angeloaktree.org/history.htm for more info. 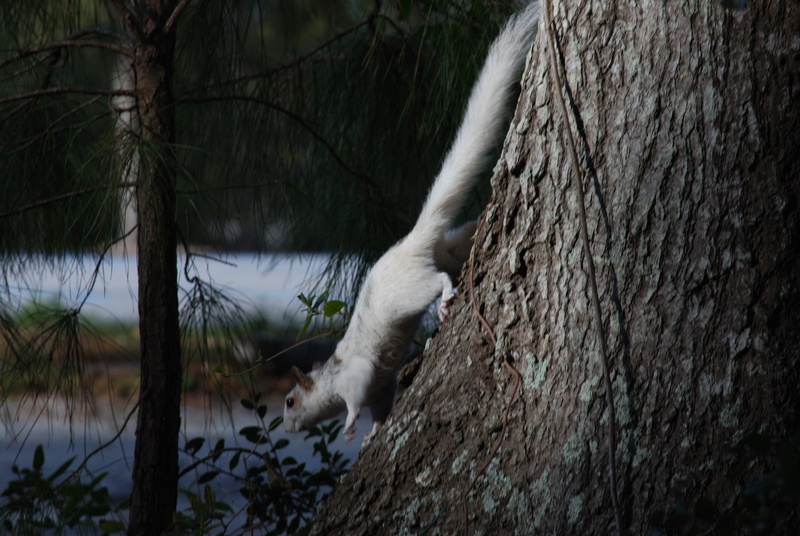 White Squirrel One above and White Squirrel Two below. Note the black stripe down their bodies. WSOne has some spots as well. I do apologize! I missed both Sepia Scenes and Scenic Sunday last week! But here they BOTH are! 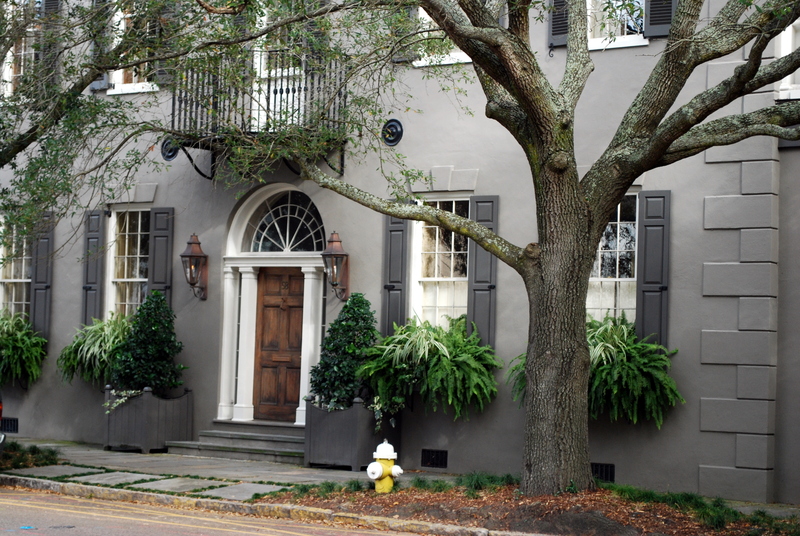 I was travelling with the grandparents and looking for a new place to live in Charleston, SC, and unfortunately, I didn’t get a chance to blog anything. I did find a place and am very excited to relocate. I’m also very excited for my husband to see the place I’ve been blabbering about for a week now and for the cats to get the space they need. On to the pictures! 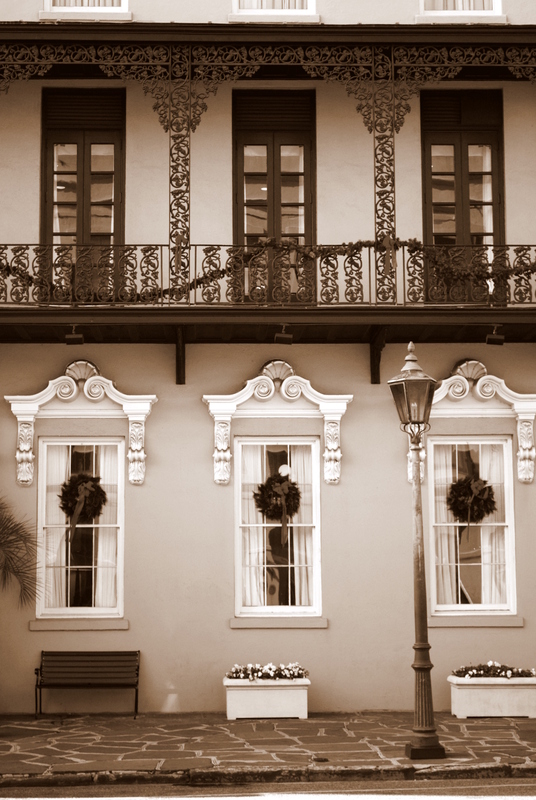 I am sure you can guess what the topic of this post will be, but if you can’t, it’s Charleston! Sepia Scenes first, and then Scenic Sunday contributions last but not least! It was hard to turn this one into sepia just because of the fantastic pink that the building is painted in, but by doing so, you can see the architectural features a little easier. For more Sepias, visit SEPIA SCENES! This is a nice one to view in the larger size, and although it’s not as flashy as most of the buildings in Charleston, I do like the calm and clean scene it provides. And since I missed last week’s, I’ll throw in a sunset. Surprise there, eh?! 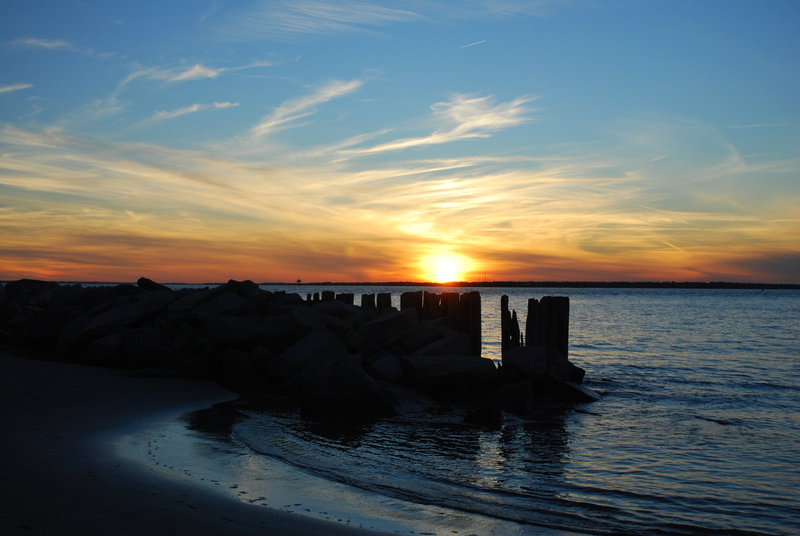 This was taken on Sullivan Island, SC right at Fort Moultrie southeast of Charleston. For more Scenic Sunday pictures, click HERE! Thanks for visiting! Happy New Year! Here’s to a great and peaceful year! Ryan and I decided to trade cars because of the lack of Saturn support up here, so we met half way, which ended up being Gothenburg, NE. I took US 83 down through the Nebraskan Sand Hills, and by George, they are made of sand! It would be a rather difficult journey across them in a wagon or by foot. It’s like walking across dry beach sand. There were a lot of flowers in them though. In Gothenburg, there isn’t a whole lot to see, but there was a Pony Express buildling, taken from the old McPherson Fort to the west. It’s only the top half of the two story building, but it’s pretty interesting history. The Pony Express only lasted 18 months! I bet the horses were thankful for that! In North Platte, we went to the biggest train yard in the world. More technically, it’s the biggest classification yard in the world, where they sort cars and send them in the right direction, run by UP. They built an observation tower about a year ago, called the Golden Spike, and even if you don’t really like trains, it’s definately worth the visit! This is just the view of the east-bound side of the yard. We then went to the McPherson National Cemetary. Very well kept. This fellow must have worked for the National Park Service. Unfortunately, it was only two days of hanging around in Nebraska. 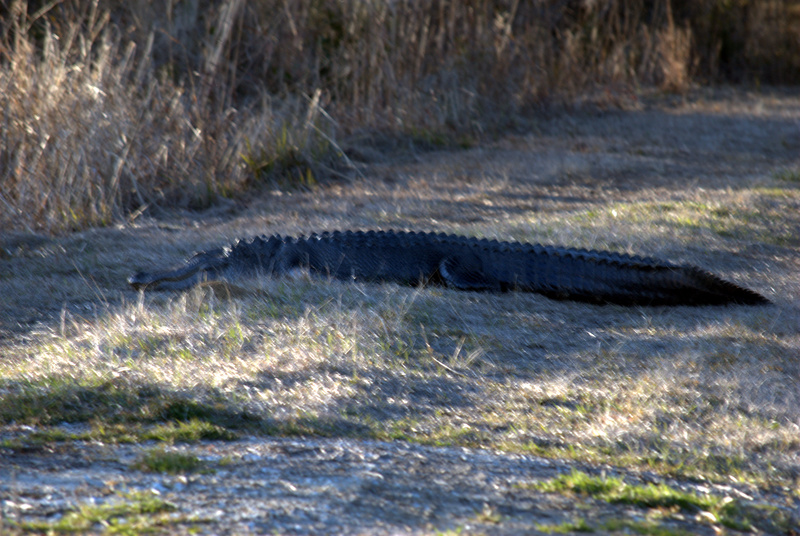 On the way back, I stopped a couple of times in the Valentine National Wildlife Refuge. The sky was pretty darn amazing. I used to not like seeing so much of the sky since I had grown up in the dark understory of dense trees, but I have grown used to it, and often look up now instead of down. There is quite a lot of expression in the sky at times. The prairie is a tough book to read some days. You really can’t get a hold of any meaning while driving through it. There are some days where the sky is overpowering and then there are some that you can make it more than two feet without stopping to look at something at your feet. It is a subtle place, but a treeless plain it is no more. I still am amazed at the amount of trees down by the Platte River. When you read accounts from Oregon Trail travelers that say that there were no trees to been seen for days and days, you can’t hardly imagine it with the virtual forest that is growing there currently. Alright….the ‘animals of the Badlands’ post is still in the works. I have two weeks and a few days left until I go up there, so it will get done. We went to Cheney Lake for the millionth time, I guess out of boredom. We ventured to the east side instead of the west side and it is pretty much the same. Lots and lots of campsites, some of which are almost in the water. I’ve not really figured out how to pronounce this place. I say it like the former vice president’s name, but I’ve heard other pronounciations around here. There were signs that they were practicing land management there. There were a few burned areas, but most of the wood duck boxes are still sitting crookedly in water. We also noticed a rather omnious ‘guest’ living in the lake. I’m sure these zebra muscles are giving them quite a headache. It’s not a good thing to have these things in your water. I’m holding a small pebble, which is a pretty good demostration that these guys like to repopulate and crowd areas in vast numbers. 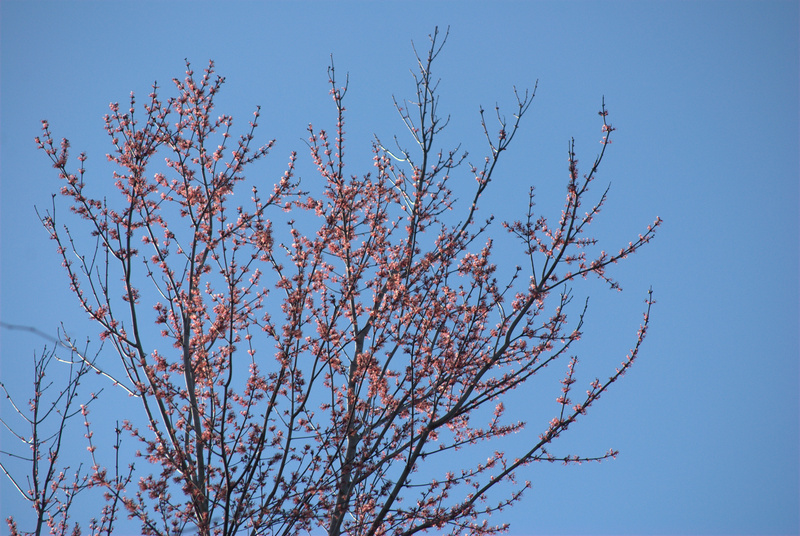 Aside from the non-native inhabitants, we did see some native signs of spring. There were turtles sunning themselves, peepers peeping, and there was a muskrat that honored us with his cleaning routine before he swam away [my camera is not quiet]. On to other non-native wildlife species, we went east of Wichita again to TWP…Tanganyika is a region or area in Africa in between the Indian Ocean and those large lakes over there. But that doesn’t make it any easier to say. TWP is an interesting place, rather new, and still under construction. There are a good number of animals on display, with more coming as exhibits are constructed, and there are a good number of babies being born. This ‘wildlife park’ used to fully be a rehabilitation center, not open to the public. You still get that feeling when you go in. We were there before ‘school let out’ so there wasn’t a multitude of staff floating around, and our soft pretzel wasn’t so soft, but it was a very amazing visit. You walk out of the gift shop and you have an elaborate waterfall on your left, giraffes right in front of you, and gibbons to your far left. There isn’t really a map, but they give you a feeding schedule. When they say feeding, it will be you that does the feeding in most cases. We first stopped at the lorikeets. We were the only two people in the area at the time. These colorful birds aren’t shy, so when you walk in with the little cup of nectar, you will be a living bird perch until all the goodies are gone. If you still stand there, you will invite curious birds who like to chew on various parts of your body and redo your hairdo. The above picture was taken when we were out of nectar. I don’t think I could have reached my camera with so many birds sitting on me. I had a couple on my head [sunglasses make good perches] and a good handfull on arms and shoulders. There is no signage that mentions they can chew small fingers off, but lucky for me, I only had a little skin taken off while trying to keep two from fighting over the food. From there we went to look at the rhino and the colobus monkeys before the next feeding. This little guy was entertaining to watch, as were his older cagemates. They danced and played and chewed on the grass. From there, we went into the kangaroo pen for a scheduled feeding, but we were the last of a large mob, and there was no feeding going on, so we briskly walked through and went on to gawk at the gibbons. They were making a bit of noise, howling and the like, so we watched their antics that culumulated into a dangling-by-one-arm wrestling match. Despite the look in the picture, he wasn’t really that lazy and only sat for approximately three seconds before bouncing along. From there, we went to feed the lemurs, and although we were the last bunch let in, they still had some room for our treats and were a little eager even. Aside from their googly eyes and springy movements, they are actually very dainty creatures with small teeth and no nails. They were a little shy and only approach if you bend down to an approved level or sit on a rock that they can get on, too. You have to carefully guard your stash of treats since they won’t take just one. The best way to feed them is to give them one at a time and not let their little hands get ahold of your other hand. The amazing part is watching them jump around and climb like gravity has no effect on them, yet they are light touchers with very soft hands and fur. If that doesn’t pluck on your heart strings, walk past the ‘nursery area’, adjacent to the snack bar, and you will find a little lemur whose mother didn’t feel like taking care of him. Sitting in his incubator with a large stuffed monkey, this little guy, Elmer, seems to be more interested in the people that walk by. He seems like he wants a hug more than anything. Cute, eh? Very interesting park that looks like it has a very promising future and promises many futures for exotic wildlife.